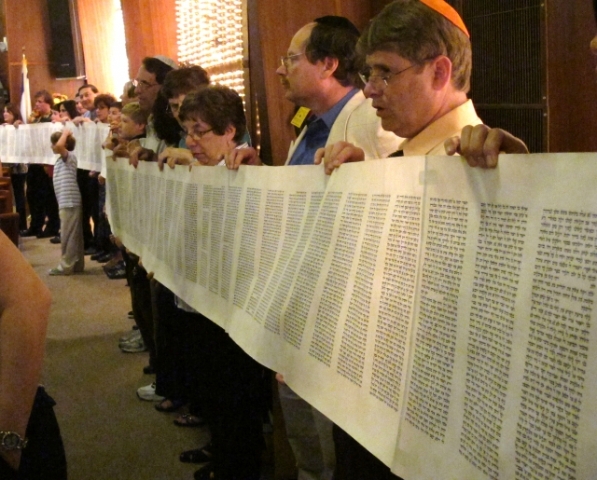 Simchat Torah (Rejoicing in the Torah) celebrates the completion of the annual reading of the Torah. This joyous festival which falls at the end of Sukkot provides opportunities for us to affirm the centrality of Torah in our lives, as well as to demonstrate our commitment to lifelong study of our sacred texts. As part of the celebration, the Torah scrolls are often taken from the ark and carried or danced around the synagogue. During the Torah service, the concluding verses of the Torah are read and immediately followed by the opening verses. This practice highlights the cyclical nature of the reading of the Torah.